Next on the list of failed Chumph Administration officials…Betsy DeVos. Although unlike a growing list of her fellow appointees, she doesn’t appear to be headed out wearing an Orange Jumpsuit. She is just quitting because of rank incompetence. I mean she is so bad she can’t even reach over the decidedly low low bar to get fellow Republicans to support her destruction of the public school system and white’s only Charter Schools. resident Donald Trump’s Secretary of Education Betsy DeVos is “one of the most ineffective people ever to hold the job,” say some insiders, and education officials are already starting to plan for a “post-Devos landscape” when she is removed or steps down. The Secretary wants to allow parents more freedom to withdraw their children from public schools and enroll them in charter schools, religious schools and private schools. What makes DeVos radical is she wants federal tax dollars to follow those children out of the public school system. One problem with implementing her plan is that public schools receive very little of their funding from the federal government. Another is her overall unpopularity and ineffectiveness. Her first budget proposal for the department — one which would have slashed funding from multiple school programs and reapportioned that money to DeVos’ pet cause, “school choice” — was rejected by Congress. Now, with her agenda on the rocks and morale at the Education Department cratering, some predict that DeVos may return to the private sector sooner than she’d planned. 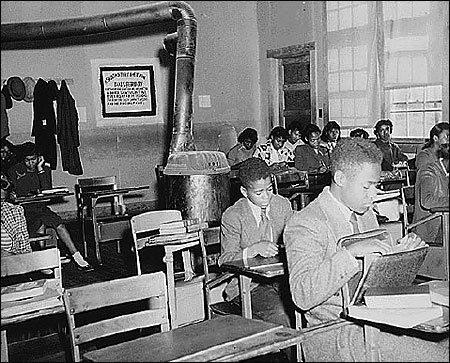 After schools were desegregated, in the South thousands of segregated private Charter Schools were built. Diversity is sorely lacking at many private Christian schools, some of which were originally founded to keep blacks out. Nothing dismantles claims of “post-racial” colorblindness quite like white Christian schoolchildren casually debating how to say the n-word. A student from the First Academy in Orlando, Florida, was criticized recently on social media for an Instagram post asking whether it was more “respectful” to use the n-word with an “er” or an “a” at the end. Sadly, the Instagram post is not that surprising, given the typical racial makeup of many Christian schools and their history of segregation. While Catholic schools have existed throughout U.S. history, private Christian schools emerged en masse in the aftermath of the civil-rights movement. The Supreme Court declared public-school segregation unconstitutional in its unanimous Brown v. Board of Education decision in 1954. Many school systems, particularly across the South, resisted compliance while some families saw the handwriting on the wall and decided to act. Fearful at the thought of their children mingling with black students, many white Christian families founded private “segregation academies” to skirt the law. Many were “Christian” institutions, and fundamentalist evangelicals founded several of the most prominent ones. Non-Catholic Christian schoolsdoubled their enrollments between 1961 and ’71. Moral Majority founder Jerry Falwell, for example, started Lynchburg Christian Academy in 1967, when his town’s public schools integrated. Because Brown did not apply to private schools, institutions like Falwell’s could practice segregation while still receiving federal tax benefits. But all of this changed with the series of Supreme Court decisions in the late ’60s andearly ’70s that forced public schools to integrate and declared racially discriminatory private schools ineligible for tax-exempt status. Despite pressure from the government, these private Christian schools refused to go quietly into the night. Some refused to cooperate with IRS inquiries, hiding their internal operations behind the banner of “religious freedom.” Others, such as Bob Jones University, proudly declared their racist policies. But most knew they needed to change their rhetoric in order to survive. This ‘anti-liberalism’ line was enough to provide cover for these private Christian schools. Only a few actually incurred penalties from the IRS. And similar institutions flooded the American marketplace, positioning themselves as viable alternatives to public education for white families. Between 1970 and 1980, enrollment in non-Catholic religious schools more than doubled, to 1.3 million from 561,000. And by the early 1980s, religious right leaders like Jerry Falwell and Tim LaHaye, bragged that evangelical Christians were opening new schools at a rate of three per day. While they figured out how to win the culture wars, these white Christian leaders figured they could retreat to private schools where they could teach children as they pleased. These schools thrived throughout the following decades with predominately white student bodies and leadership. In a sweeping survey of Christian schools, journalist Paul Parsons estimated that minorities constituted less than 3 percent of the student population in most of these schools during the mid-1980s. In 1987, the Association for Christian Schools International’s executive board included 29 white people and exactly zero racial minorities. That history has proven difficult to shake for today’s private Christian schools. The institutions are still overwhelmingly attended by children from wealthy white families. Forty-three percent of these private schools have student bodies that are at least 90 percent white. In many Southern Christian schools, not a single black person can be found. At others, only a handful of minority children attend. These students are shaped by Christian schools curricula that purport to teach “traditional values.” Randall Balmer, a historian of religion at Dartmouth College and author of The Making of Evangelicalism, said many popular textbooks used in Christian schools teach American history in ways that privilege white culture. For example, the books often downplay the displacement of Native Americans or minimize slavery by noting its “positive effects,” such as introducing slaves to Christianity. 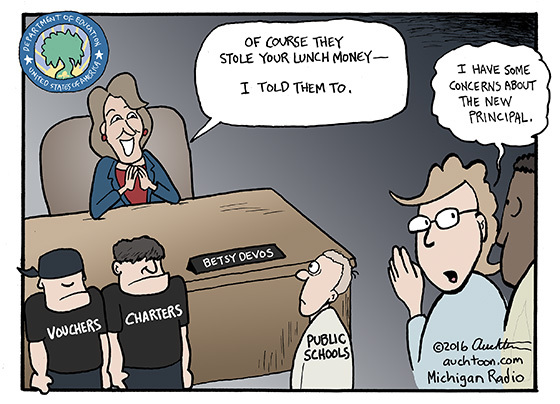 How Bad are Charter Schools? Not only are Charter Schools educationally lagging the Public School Districts which they supposedly serve, new evidence is emerging that their sometimes strict, and in some cases severe discipline is resulting in up to 8 times the violent incident level than hat experienced in Public Schools. Why Has Charter School Violence Spiked at Double the Rate of Public Schools? Meanwhile, charter advocates continue to criticize the safety of traditional public schools. A few weeks after The New York Times released a controversial video of a Success Academy Charter School teacher lashing out at a student, New York City’s deep-pocketed charter school advocates are looking to shift the public narrative on who is committing violence in city schools. 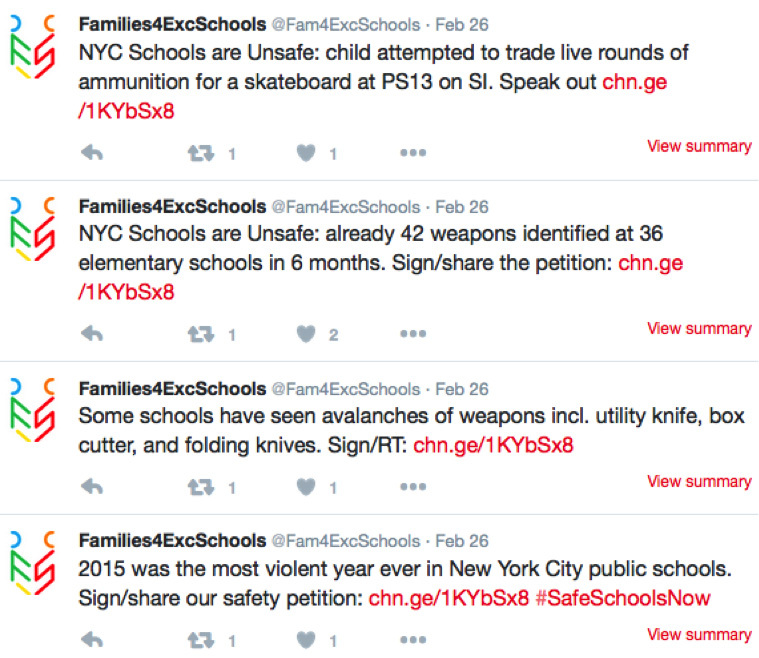 Over the last few weeks, Families for Excellent Schools, a charter school lobbying and advocacy group with close ties to Success Academy, has placed TV ads, held a press conference, and taken to social media, claiming New York City public schools are in a violent “state of emergency.” The charter school campaign appears to be a response to the public backlash that Success Academy has received for its controversial disciplinary approach. 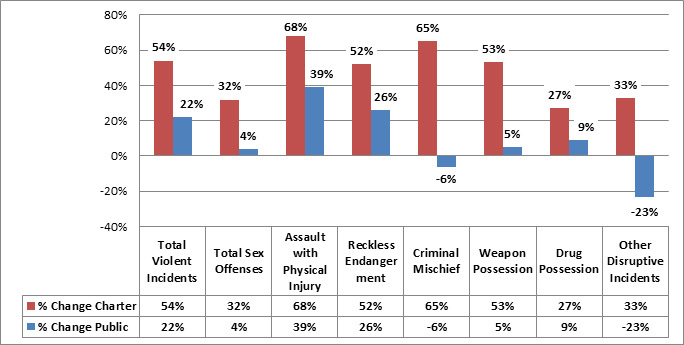 Taking state data, which includes “violent” incidents not involving the police, Families for Excellent Schools asserts that between 2014 and 2015 schools suffered a 23 percent uptick in violence. The public action was meant toundermine New York Mayor Bill de Blasio, who recently claimed school violence has gone down, thanks to his administration’s softer disciplinary approach. A Nation analysis of the charter school group’s data, however, suggests the move may backfire, since the numbers also show that charter schools themselves reported a far higher spike in incidents of school violence, 54 percent, more than double that of the public school average between the 2014 and 2015 school years. Breaking the data down further, The Nation also found that while NYC public schools, perhaps responding to the district’s disciplinary reforms, actually dropped in nonviolent offenses like “criminal mischief” and “other disruptive incidents” at -6 percent and -23 percent, respectively, charter schools had a 65 percent surge in reported incidents of “criminal mischief” and a 33 percent surge in “other disruptive incidents.” Notably, charter schools also had far higher reported surges in drug and weapons possession incidents, at 53 percent and 27 percent respectively, whereas public schools only had 5 percent and 9 percent jumps for the same categories. New York City charter school students represent a relatively small amount of the city’s overall population, and therefore make up only 4 percent of total violent incidents in New York City schools, but these drastic disparities raise questions about how charter schools’ controversial disciplinary cultures relate to the dramatic increase in reported school violence. Brenda Shufelt, a recently retired librarian who served public school and Success Academy Charter School students at a colocated school library in Harlem, said that as charter schools rapidly expand, they may be taking in more high-needs kids, many of whom cannot conform to one-size-fits-all disciplinary approaches. Examining the 10 charter schools with the highest reported incidents of violence in 2014 and 2015, The Nation also found that reported incidents escalated 485 percent last year over the previous year, more than four times faster than the growth of violent incidents for public schools of the same category. 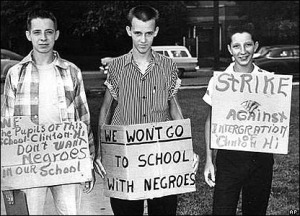 Charter Schools were initially set up throughout the South as a methodology to try and defeat integration and Civil Rights. The function of todays’ hyper-segregated Charter Schools really isn’t any different. The legacy of Jim Crow laws lives on, five decades after they officially ended. 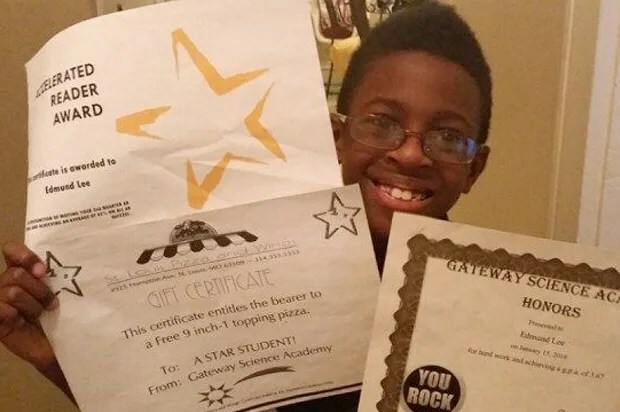 Edmund Lee is a third-grader at Gateway Science Academy in St. Louis, Missouri, a charter school he has attended since he was in kindergarten. Yet his family recently learned that he will no longer be able to attend the charter school because he is black. Lee’s family is moving to a new school district, where decades-old state laws do not allow black students to attend charter schools. School officials say they are unable to override the state law. But the school’s principal and staff have come out in support of the young boy and his family. “My son Edmund is an awesome young man. He currently has a 3.83 GPA, and has above average testing scores in language arts, math, and science. Edmund is very loving and the first to extend a helping hand if a fellow student needs help,” White writes in the petition. “So imagine our shock when we found out Edmund would no longer be allowed to attend Gateway Science Academy because he is African-American,” she continues. As of Thursday morning, more than 20,000 people had signed the petition. Some staff members at the charter school have signed it as well. This incident echoes the racist history of charter schools, which were used at the time of desegregation in order to continue running de facto white-only schools. Critics say charter schools — which are strongly backed by large corporations and hedge funds — not only undermine public education and leave poor students with access to less resources and opportunities; they also reinforce racism and segregation. “At the national level, 70 percent of black charter school students attend intensely segregated minority charter schools (which enroll 90-100 percent of students from under-represented minority backgrounds), or twice as many as the share of intensely segregated black students in traditional public schools,” the report noted. About time someone figured this one out. Charter Schools should be answerable to the same rules and measuring stick as Public Schools. People my age have little belief that the purpose of the Charters is in any way to improve the education of black children. Segregation Academies (Also called Charter Schools) were set up throughout the South to avoid integration by white parents. In the case of Prince Edward Schools in Virginia, the Public School System was shut down for 4 years, denying education to black students, while one of these Academies was set up. After nearly a year of deliberation, the state Supreme Court ruled 6-3 late Friday afternoon that charter schools are unconstitutional, creating chaos for hundreds of families whose children have already started classes. In the ruling, Chief Justice Barbara Madsen wrote that charter schools aren’t “common schools” because they’re governed by appointed rather than elected boards. Therefore, “money that is dedicated to common schools is unconstitutionally diverted to charter schools,” Madsen wrote. She was joined by Justices Steven C. González and Sheryl Gordon McCloud. The Washington Education Association was joined by the League of Women Voters of Washington, El Centro de la Raza, the Washington Association of School Administrators and several individual plaintiffs. “The Supreme Court has affirmed what we’ve said all along — charter schools steal money from our existing classrooms, and voters have no say in how these charter schools spend taxpayer funding,” said Kim Mead, president of the Washington Education Association. “To tell you the truth, I cried. It’s been a long hard fight,” said Melissa Westbrook, an education blogger who chaired the campaign opposing the charter-school law in 2012. Joshua Halsey, executive director of the state charter-school commission, criticized the court’s timing. The state Attorney General’s Office said attorneys are reviewing the decision, but had no comment Friday. David Postman, communications director for Gov. Jay Inslee, said the governor’s office is reviewing the court’s decision and will consult with the Attorney General’s Office. “But until we have a thorough analysis, we can’t say what that means for schools operating today,” Postman said. Under the 2012 law, up to 40 new charter schools could have opened in Washington over a five-year period. In December 2013, King County Superior Court Judge Jean Rietschel struck down the part of the law that would have made charter schools eligible for state construction money, but essentially cleared the way for the state commission and the Spokane school district to authorize new schools. Spokane is the only school district with such authority. All sides expected the case to reach the Supreme Court, which heard oral arguments last October. He said the commission’s lawyer in the Attorney General’s Office will be meeting Saturday morning with other attorneys to discuss options. The attorney for the plaintiffs, Paul Lawrence, doesn’t think there’s much more legal work to do on the issue. But he acknowledged that much has to be sorted out regarding the nine charter schools that are already up and running. This may seem like ancient history to some folks, but I lived through some of this in an adjoining county – and I’m not retirement age yet. Desegregation in Virginia, as I as it was in other southern states was a battle. In Prince Edwards County, only about 25 miles from Washington, DC. it extended into the longest battle in the country. My Mom actually taught at the sister school to this one. It was a one room school, without electricity. She later taught at the Cub Run School, another one room school located on the grounds of what is now the Udvar-Hazy Air Museum adjacent to Dulles Airport from 1949 to 1952. Desegregation of schools didn’t happen overnight, and some counties actively resisted until the bitter end. There was the requisite violence by the usual suspects, as well as threats and intimidation. One of my cousins lost 4 years of High School because the county just shut all the schools down, instead of desegregating. He would get a GED through a program sponsored by the local churches for black kids caught up in this, because why go back to high school at the age of 18, to graduate at 22? The white folks didn’t suffer, they opened segregated Charter Schools. The Prince Edward Foundation created a series of private schools to educate the county’s white children in 1959 after shutting down the Public School System in the County. These schools were supported by tuition grants from the state and tax credits from the county. 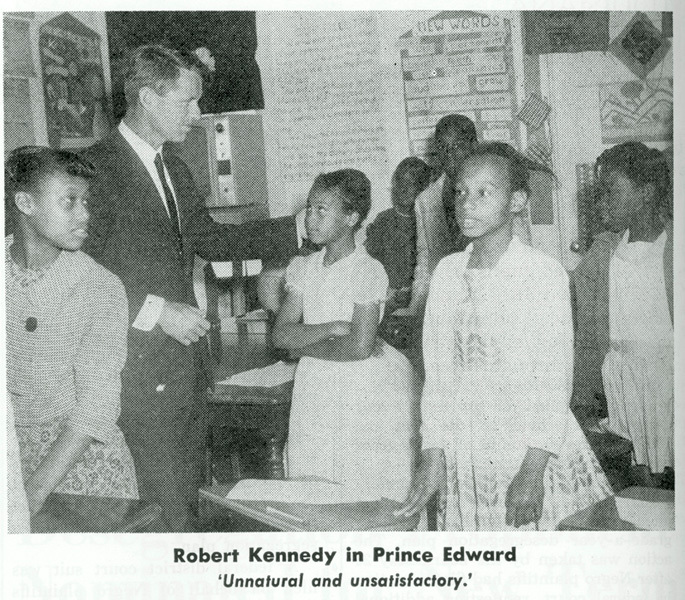 Prince Edward Academy became the prototype for all-white private schools formed to protest school integration.No provision was made for educating the county’s black children. Some got schooling with relatives in nearby communities or at makeshift schools in church basements. Others were educated out of state by groups such as the Society of Friends. In 1963–64, the Prince Edward Free School picked up some of the slack. But some pupils missed part or all of their education for five years. Not until 1964, when the U.S. Supreme Court outlawed Virginia’s tuition grants to private education, did Prince Edward County reopen its schools, on an integrated basis. This event marked the real end of Massive Resistance. Among the segregated schools that Ed Peeples photographed in Prince Edward County were the all-black Mission Elementary School (above) and the all-white Green Bay Elementary School (below). I was sitting in the dark den of the last living founder of the white private school I had attended, an academy established after public schools in my Virginia hometown were closed in 1959 to avoid desegregation. Having worked as a reporter for years, I was used to uncomfortable conversations. But this one felt different. This conversation was personal. I wanted to interview Robert E. Taylor about desegregation in Prince Edward County and to find out how he felt about it in 2006, decades later. Weeks before his death, he told me he was still a “segregationist” and expressed no remorse for the school closings. Breathing with the help of an oxygen machine, he used tired stereotypes to describe black teenagers in my hometown as dating white teens, impregnating them, and leaving the teenage girls’ families with “pinto” babies that nobody would want. Taylor was talking about me. I grew up in this damaged town, but left for the West Coast and married a multiracial man of American-Indian descent. We were thinking about having kids—mixed-race children that Taylor pitied and reviled. I had, on some level, defied him and other white county leaders including my own grandfather by embracing what they most feared. White leaders wanted to protect the integrity of the white race and they had believed that integrating the schools would lead to blacks and whites dating, marrying, and having mixed-race children. White county leaders in Prince Edward took one of the most dramatic steps in the country to prevent that from happening. Facing a court order to desegregate the public schools, white officials instead voted not to fund them—an option Prince Edward officials had considered for years. A 1951 walkout by black students to protest the conditions at the county’s black high school had resulted in a lawsuit that was later folded into the landmark Supreme Court case, Brown v. Board of Education. White leaders worried that their little community, in the heart of Virginia, would be held up as an example to the rest of the nation and required to integrate its schools early. Bolstered by Senator Harry F. Byrd Sr., the powerful Virginia politician who suggested rejecting Brown and the town newspaper, The Farmville Herald, Prince Edward altered the way it funded its schools. By switching to a month-by-month budgeting process, county leaders would be able to cut off funding and shut down the schools quickly if required by the courts to desegregate. Meanwhile, white businessmen made quiet plans to establish a private school for their children. When the public schools were locked and chained in the summer of 1959, white leaders sprang into action. By the time Labor Day rolled around, the county’s church basements and social clubs had been outfitted with desks that white volunteers made from scrap materials. These schools, funded with a combination of donations and public monies, were far from perfect—tiny classrooms were scattered around the region without cafeterias or playgrounds. Yet these schools showed the lengths white families were willing to go to avoid having their children attend classes with black students. Black families, meanwhile, debated what to do with their children. No one knew how long the schools would be closed; black leaders didn’t think it would be more than a year or two. Opening another private school would have contradicted what they were trying to accomplish. Some parents who had resources sent their older kids across the state line to a North Carolina college that had agreed to educate some of Prince Edward County’s high-school students. Others asked relatives to take in their children; some even allowed their kids to live with strangers so they could attend school. Some snuck their children over county lines to be educated in adjacent communities. But the vast majority of children stayed home and their only formal education would come in the form of church training centers. There, for a few hours a day, volunteers taught the kids basic skills. Many children simply played or, if they were old enough, went to work in the fields with their parents and pick tobacco. Some would never return to school. 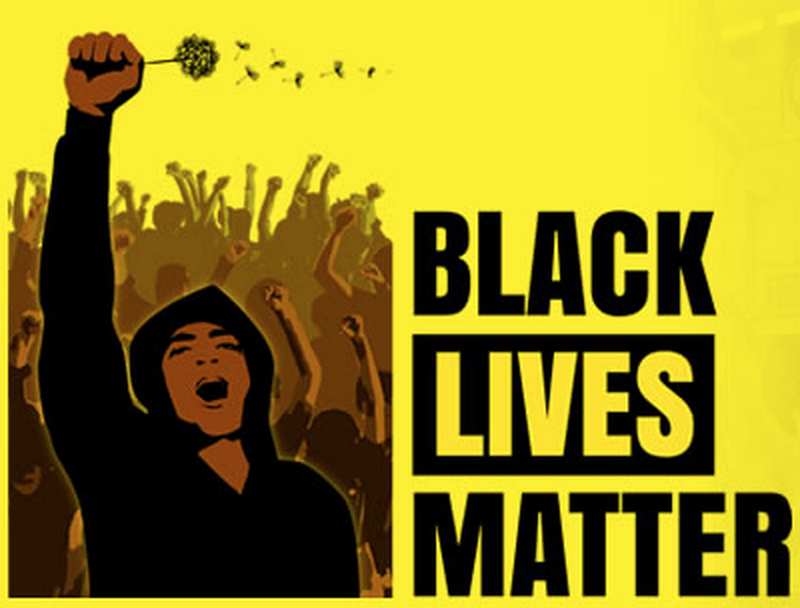 State leaders did not come to the defense of the black children and their families. The Farmville Herald and other newspapers across the state supported the county’s decision. A lawsuit to reopen the schools slowly made its way through the courts, as black children—and some whites—went year after year without educations. It would take another Supreme Court decision to force county leaders to reopen the schools in 1964. When I was growing up, I knew this story in only the most general of ways. I didn’t have black neighbors, black friends, or black teachers. I hadn’t a clue how the closures had affected the only black person I knew as a child—my family’s housekeeper, Elsie Lancaster. Elsie worked for my grandparents when my mother was a child then worked for my parents for decades, too. She had sent her own daughter Gwen to live with an aunt in Massachusetts when the schools closed. My grandparents never even asked about Gwen after Elsie had accompanied her to Cambridge. I attended the white academy my grandparents had helped found. I was entering eighth grade when Prince Edward Academy first admitted black students in 1986 in order to have its nonprofit status restored by the federal government. After college, I worked as a journalist, moving to Oregon, California, and Massachusetts. I began to recognize the privileged circumstances in which I had been raised and took an interest in writing about marginalized communities—people of color, immigrants, and those living in poverty. After I met my husband, Jason, and we thought about having children, the story of my hometown took on more meaning. I knew that the history of my hometown would be our kids’ history, too. When I delved into Farmville’s past, it became clear that I couldn’t just blame my hometown for the shameful school closures. My family was also at fault. During the course of my research, I discovered that my late grandfather, S.C. Patteson, had been a founding member of the Farmville chapter of the Defenders of State Sovereignty and Individual Liberties, which sought to prevent desegregation. As I worked to describe what had happened in my hometown before I was born, affected students opened up and shared the stories of their childhoods, their wounds still raw. White members of the community—many of whom knew my grandfather—were more reticent to speak with me. By telling the story of my hometown, I was picking at a scab that was never allowed to heal. Even my high school history teacher shut down the conversation, suggesting the story had already been told.